This message on this card reads: "Harry, With love from Auntie Alice". 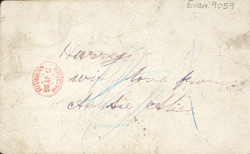 Harry being a popular corruption of Henry, perhaps this card was sent to Evanion himself - Henry Evans. Greeting cards were first sent in Britain in 1843, when Sir Henry Cole printed a thousand cards and sold them in his art shop in London for one shilling each. The idea of sending such cards was encouraged by the railways: post could be delivered quickly across the country, and in 1870 a halfpenny postage rate was introduced.